Sea Scape is a North Myrtle Beach resort that is a wonderful and pleasant seaside escape for your North Myrtle Beach vacation. This oceanfront North Myrtle Beach resort is in the Crescent Beach section of North Myrtle Beach, South Carolina. It is a North Myrtle Beach vacation destination that is just a few blocks from Highway 17 and located on the beachfront between 26th and 27th Avenues South. Not only is this North Myrtle Beach resort easy to find, but it is a North Myrtle Beach resort that is near Myrtle Beach golf, live entertainment theatres, waters sports, shopping and more dining options than you can imagine. This oceanfront North Myrtle Beach resort is a three-story building that has North Myrtle Beach condominiums that face north, east and south. 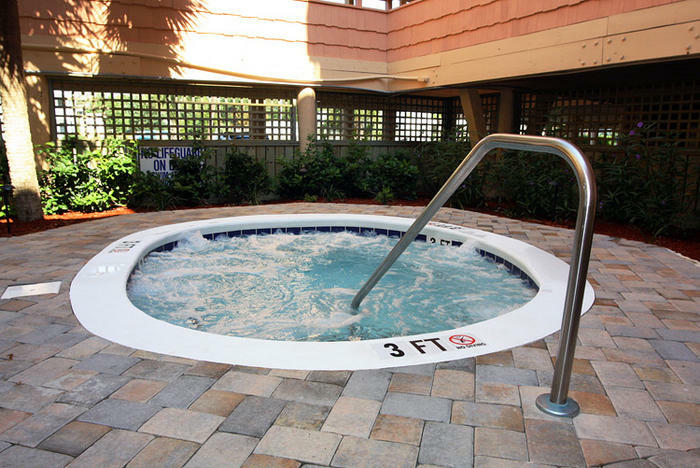 In the middle of this North Myrtle Beach resort is a quaint courtyard with a hot tub surrounded by nice and pleasing landscaping. The swimming pool at this beautiful oceanfront North Myrtle Beach resort is on the oceanfront. The sparkling blue swimming pool is surrounded by chaise lounge chairs so you are invited and encouraged to relax poolside for long stretches of time during your North Myrtle Beach vacation day. Between the pool deck and the white sandy beaches are a few scattered palm trees, a sandy dune line that is laden with sea oats and nothing else. Follow the path to the beachfront, kick off your shoes and let the relaxing begin! Playing on the oceanfront that is behind this North Myrtle Beach resort is a real treat. Bring a football and toss it around or throw a Frisbee just for fun. Goggles are necessary if you want to explore the hidden seashells beneath the water’s surface and rafts are a must if you want to ride the waves. Swim in the shallow ocean water and wade in the low tide out to the sand bar. When you vacation at Sea Scape you can take long, leisurely walks north and south and pick up seashells, admire the views and people watch. This North Myrtle Beach resort on the oceanfront has spacious accommodations and each of these condos in North Myrtle Beach, South Carolina has an ocean view balcony. Bring your family to a large, three-bedroom North Myrtle Beach vacation rental at Sea Scape. With two full baths there is plenty of room for up to eight people to stay together and enjoy a beachfront escape in North Myrtle Beach, South Carolina. The North Myrtle Beach vacation rentals at Sea Scape are full of amenities. In addition to the three private bedrooms and two full baths, these North Myrtle Beach condo rentals have a half bath for your convenience. There is a beautifully furnished kitchen in these condos in North Myrtle Beach, South Carolina that are full of dishes, utensils, pots and pans. Use the toaster in the mornings and the dishwasher and microwave throughout your North Myrtle Beach vacation day. The coffee maker in the kitchens of these North Myrtle Beach rentals might be your best friend early in the morning. Brew a fresh pot and then take a cup out to the ocean view balcony. Elliott Beach Rentals is not affiliated with onsite management or the HOA of Sea Scape.